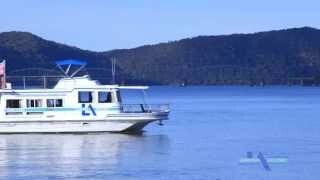 The Hawkesbury is a wonderful waterway, and the best way to see it is by boat. Whether you are interested in fishing, water sports, spectacular scenery, or just getting away from it all, Luxury Afloat Houseboats have the boat that is perfect for you. House boating is not expensive. By sharing costs with your friends; staying on a boat is cheaper than a motel - with all round water views. Who wants to fill a car with 10 sets of bed linen or camping gear? Just arrive with your food and towels and they will supply the rest. Imagine this... It's a beautiful day on the Hawkesbury River. The sun is shining. The fish are biting. And there you are sitting back with a cold drink in one hand and a fishing line in the other. .....Well you can with Luxury Afloat.